Every few years I seem to have some sort of personal epiphany about my appearance…I’ve been blonde, brunette and brassy, bespectacled, spectacle-less and then bespectacled again, and have since my teen years, had locks of a variety of lengths including a white blonde Annie-Lennox-style crop at the time of my sister’s medieval-themed wedding! On my last trip to tresses-tamer extraordinaire A, I mentioned I’d been thinking about losing the locks but wasn’t quite ready…so we’ve been anticipating yesterday’s appointment with a mixture of excitement and trepidation. So why was I so nervous about my decision to go short again? One of the things about your hairdresser is that if you go every 6-8 weeks like I do (I am a Leo and having fab hair is essential to a worthwhile life – so sue me! ), you see them more often than many of your friends. A has been doing my do now for about two years so we’ve been ‘there’ through many ups and downs in our respective lives – she’s heard about new job, redundancy, the not quite right transitional job, death of partner’s mother, friend’s cancer scare, the death of my relationship and subsequent return to singledom, another new job and Christmas holidays in Melbourne – so when she mentioned that perhaps I wasn’t ready last time because I was already dealing with too many changes, I thought she probably had a point. So I showed my pictures, pressed my sweaty palms together, tried desperately not to notice the great wads of brown (with silver-highlights!) scattered around the chair, on the floor and in my lap and breathed…deeply. Off with my head…of hair! 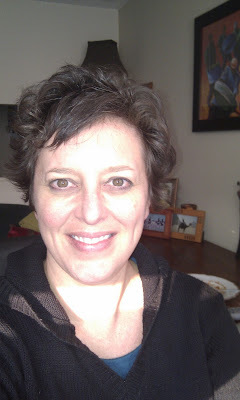 This entry was posted in All About Me and tagged haircut, Leo by Kym Hamer. Bookmark the permalink. I love it, too! I envy you being blessed with natural wave and body. I went short a few years back, and compared to your 'do, it looked a little flat. Still, like you, I found it liberating. So now I'm letting it grow out again. Boring!